« Southeast False Creek AVENUE ONE Vancouver Parkside Condos Now Selling! Located at Cambie and West 37th Avenue Vancouver, the new Vancouver HENRY Condos is a luxurious parkside residence just steps from Queen Elizabeth Park and Oakridge Centre. 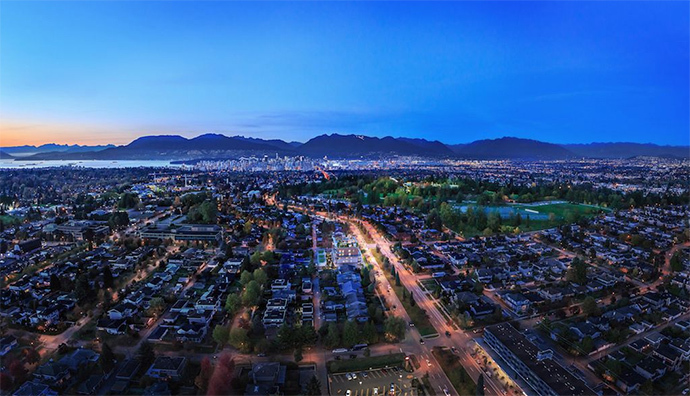 These Westside Vancouver parkside residences are located within a very sought after neighbourhood that is close to the top ranked schools (both public and private), prime shopping/retail, community services and amenities and major thoroughfares for transit and car. 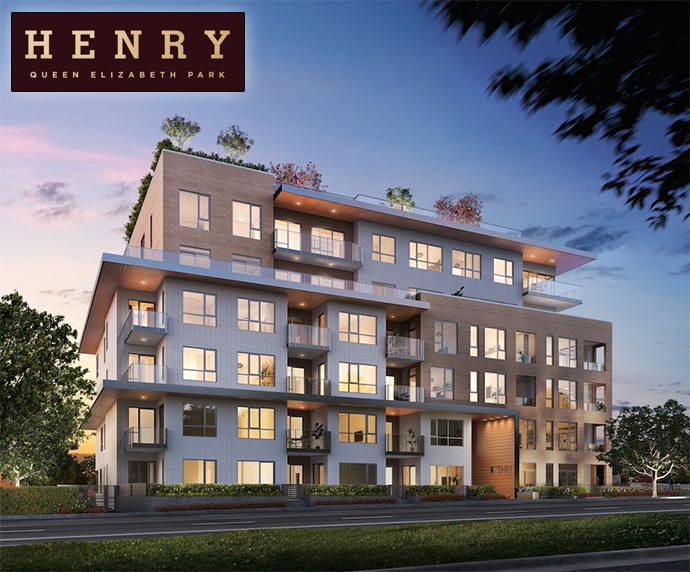 The QE Park Henry Condos in Vancouver will feature a 6 storey boutique low-rise building with stunning architecture that is both modern and timeless. There will be contemporary wood detailing on a white brick façade and the parkside residences will feature floor plans that range from studio layouts to family sized 3 bedroom homes. There will also be a limited selection of presale Vancouver Henry townhomes for sale. The floor plans will range in size between 430 square feet (studio plans) to over 1,440 square feet (3 bedroom and townhouse layouts). Some of the features at the Westside Vancouver Henry condos include over height ceilings, engineered hardwood floors and air conditioning. Parking and storage is also included with each home. The penthouse units at Henry Living will feature roof terraces. The on-site amenities includes a common rooftop terrace for residents. There are only 48 homes for sale along the tree lined Cambie Corridor. The project is brought to the market by Homei Properties developer and the contemporary architecture is by GBL architects. The modern interiors are designed by award winning firm, Portico Design Group. For more details about the Vancouver Henry QE Park residences, please visit www.henryliving.com today or you can simply register your interest at the top of this page for all the latest availability and pricing. The latest update for the presales Vancouver Henry Condos by Homei Properties is that the official launch will be some time in March 2017! Unparalleled connectivity, a variety of on-site and community amenities and peaceful, well established streets make the Henry Vancouver Westside condos one of the best developments this year. It’s a highly desirable West Side location that is close to the SkyTrain, Oakridge Centre and of course, beautiful QE Park. All homes at Henry by Homei will be released at once and they will include 1 to 3 bedroom condos (as well as studios) in addition to 2-level townhouses. All homes will have outdoor living spaces and some will have great views. All homes come with a storage locker and parking (number of stalls depends on the suite) in addition to air conditioning. There will also be 2 colour palettes for presale homebuyers to choose from and some optional upgrades are available upon request and at an additional cost. The kitchens are chef-inspired with paneled appliances and the top of the line appliances in addition to bathrooms that are elegant and spa-inspired. The living spaces at the Vancouver Henry Condos will be sophisticated. Henry Condos are coming soon to the Cambie Corridor in Vancouver’s West Side real estate district! Only 48 luxurious parkside residences at Cambie and West 37th Avenue in Westside Vancouver are available for purchase at Henry. The layouts range from studio plans to three bedroom apartments plus a limited selection of townhouses. Henry Vancouver condos are located in the heart of the Queen Elizabeth Park community (or Cambie Corridor), just steps from Oakridge Centre. The Henry Condos in Vancouver Westside are also centrally located close to the Canada SkyTrain Line which will get residents to downtown Vancouver within minutes as well as out to YVR Airport/Richmond. The Canada SkyTrain Line also gives you easy connections to UBC and SFU as well as onto the other lines to Burnaby and the Tri-Cities. Other area highlights surrounding the presale Vancouver Henry condos include golf courses and tennis courts in addition to beautiful Queen Elizabeth Park and the Observatory. The Hillcrest Community Centre is also nearby which features a public library, fitness centre, ice rink, swimming pool and sports fields. Oakridge Centre is also just minutes away and the shopping mall will give you a variety of boutique shops, restaurants and cafes to choose from in addition to the Hudson’s Bay.